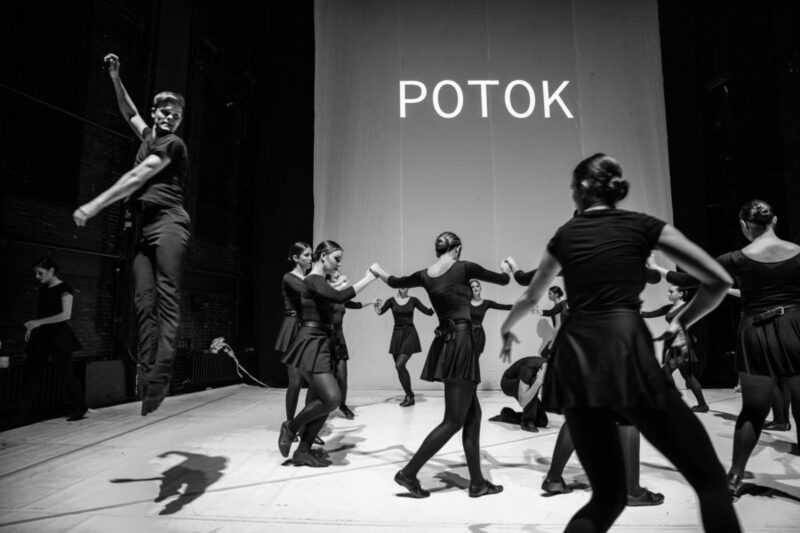 As part of the ethno-summit Tradition New, now being organized for the second year in a row by the KOLO Folk Dance and Song Ensemble of Serbia, a concert of the Novi Sad Ballet High School was held on 2 November 2018, lasting for the whole evening. 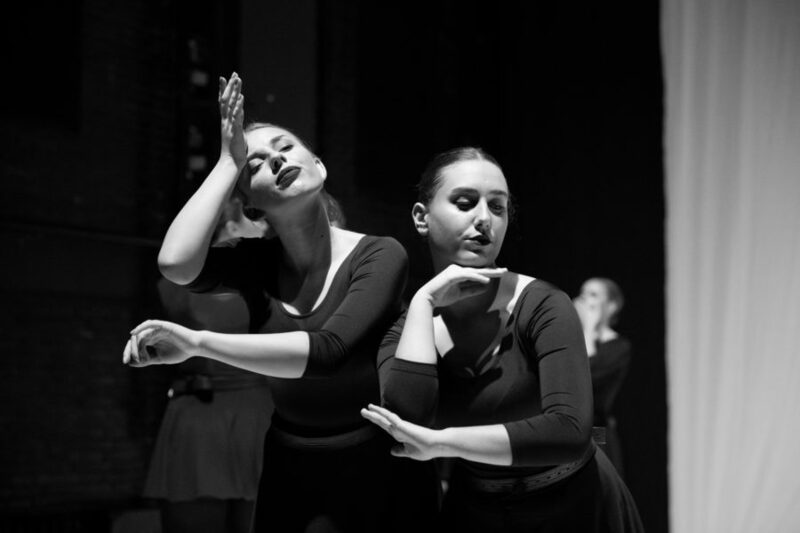 The concert was titled #MeltingPot and was, in fact, a performance given by the students from the Folk Dance Department and the students from the Contemporary Dance Department. The entire concert was put together by Mirjana Raić and Marko Dubovac, teachers at the Ballet High School, with the aid of their pupils and colleagues. #MeltingPot consists of five separate dance numbers which make up a whole: Intro/impro; Kalle mio; Birtz; Zbrda/zdola and Outro. The authors themselves, Mirjana and Marko, have stated in the program description published in the Ethno-Summit Agenda, that the aim was to re-examine ‘the use of folk dance and music on stage in a contemporary context, utilizing all the available knowledge, starting from the assumption that borders, in fact, do not exist and that, in effect, everything around us is folklore.’ There were 21 dancers in total on the stage – two male and nineteen female dancers. The first dance, titled Intro/impro was accompanied by music composed by Ivan Marković and Lenhart Tapes. The Ballet School students had already performed this part of the performance at one of the concerts as a result of which the whole #MeltingPot project emerged. What can be deduced from the performance is the authors’ intention to play with the structures – those pertaining to the music as well as those pertaining to the dance. In that respect, improvisation of the content is a key factor. In contemporary dance, improvisation is not unknown. However, where traditional dance choreography is concerned, for the most part improvisation is nonexistent and certain fixed patterns and movements are to be expected. Still, in this part of the program, the performers succeeded in improvising traditional dances in an adequate manner, although, based on the movements, one could clearly distinguish between those belonging to the Folk Dance Department and those belonging to the Contemporary Dance Department – the latter were more comfortable with performing the dance improvisations. This is not an actual criticism but merely a substantiation of the thesis that even improvisation in the arts is, in effect, a structured system in which the dancers never make up entirely new content, but always rely on the dances they had performed earlier, recombining them, at the moment of the performance, in different ways. The following dance number, Kalle mio, was accompanied by the music of the Italian composer, Claudio Monteverdi. Although the very name of the dance is reminiscent of some Italian show, it is all about playing with the audience. In the song performed by the female dancers there is a verse about grafting (kalemiti) flowers:’ he grafted, he grafted, when he was a young man’ (‘kalemio, kalemio, kad je momak bio’). The exaggerated name of the dance essentially reflects the entire message which this part of the performance is sending – in it the authors, in a humourous manner, illustrate the literal understanding that is frequently found in the amateur choreography of traditional dance. For example, if a particular song talks about how a young man gives a girl a rose, there is a good chance that the choreographer will make use of that particular solution and literally demonstrate what the song talks about. 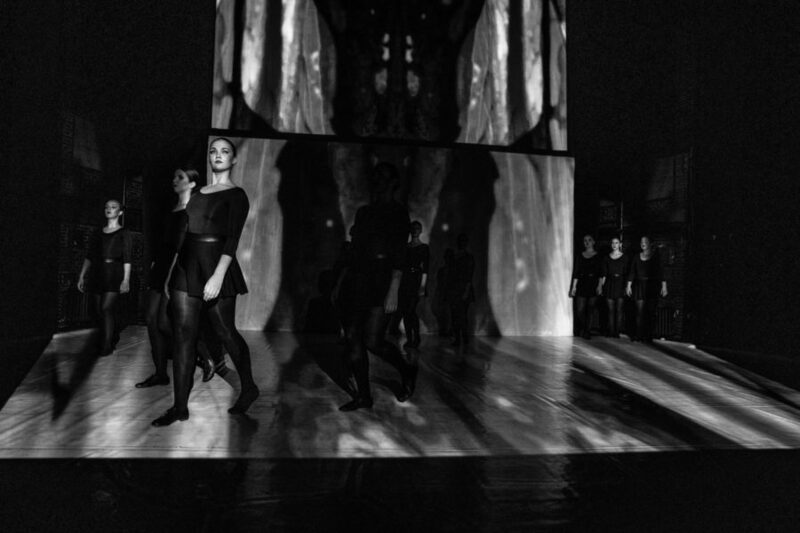 Further on in this part of the program, the authors continued their game using video projectors: when the sign ‘meadow’ was seen on the projector, the dancers covered the scene with crepe tape so that it resembled a meadow; at the moment when the word meadow was replaced by the word ‘stream’, the dancers used the same tape to create a line which represented an imaginary stream and which everyone jumped over as if there were, in fact, real water to be found there, etc. The reaction of the audience was especially encouraging in the part where the female dancers were nonverbally demonstrating what the song was about: that they were in a meadow where there was no shade and that they were extremely hot. Birtz is the title of the third number which the male and female dancers performed only with singing, a capella. What was noticeable at first was the symbolic inversion of the roles this piece was demonstrating. Birtz is, essentially, an abbreviation of the word ‘bircuz’, which means pub. In a traditional, patriarchal culture it is a place for men, thus the majority of traditional dance choreographers when showing different pubs and inns resorted to literal representations – a lot of men drinking while one woman is serving them or singing and dancing. #Melting Pot gives an inverse image of the situation where the birtz is filled with women while two young men dance in a fashion being determined by the women in their songs. The symbolic inversion of gender roles has not been present in traditional dance choreographies until now, unless the choreographies were demonstrating a particular ritual practice – which again represents a literal replication of ethnographic data, thus we can look at the ‘birtz’ as a continuation of the previous dance where the dominant approaches to traditional dance choreography were being exaggerated. 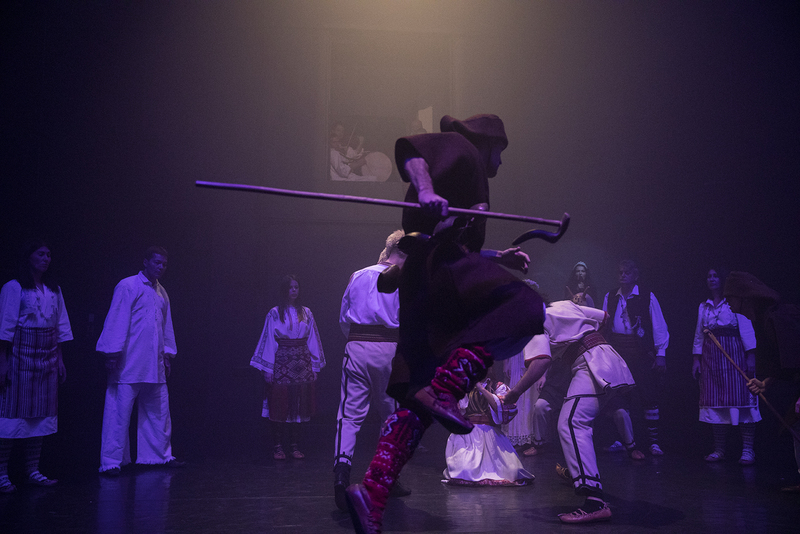 It is also significant that the dancers were performing a contemporary dance, albeit inspired by motives of traditional dance in most cases – the fusion of these two arts was the most obvious there. The fourth number Zbrda/zdola (higgledy-piggledy) was accompanied by the composition of Bojan Milinković. This piece is a classical representation of a traditional dance on stage – the dances were performed as they had been recorded out there, without intervention, in the form of a simplified scheme. Nevertheless, what stands out from the classical and desirable model is the final kolo. The dancers performed the kolo from Uzice, while the interpretation of this dance was not unified among all the dancers – it appeared as if this dance was being performed in an opportunity to dance that had arisen , where dancers perform the kolo in the way they feel it should be danced at the given moment, and not on stage, using planned choreography. Even though the dancers were dressed in black dancing equipment throughout the performance, the video presentations in this particular dance showed the same dancers in national costume. In certain moments, the dance on the stage and the dance in the video presentation were synchronized, and the audience was able to see the national costume – the inevitable stage wear in choreographed folk dance, as well as dancing equipment which the audience cannot see at folk ensemble concerts. The final dance of the #MeltingPot was titled Outro and was performed to the music of Pan Sonic (4, 41 / Lahetys). The dancers here demonstrated the complete process of preparing the choreography and the concert. The video beam spun concepts every traditional dance performer most frequently hears during choreographing and practice: triple jump, hop, straighten up, smile, accentuate. etc. The dancers on stage showed teachers in the process of preparing the performance as well as the students themselves. One group directed the other while singing; the male and the female dancer were the ones who corrected the others, showed them how they should be standing, how to accentuate a movement and so on. The merging of elements from the registers of traditional and contemporary dance was also apparent in this piece. Moreover, it was evident that the video presentation was serving the whole performance at the end when the dancers had their backs to the audience while the dancers in the video recording were those who, facing the audience, bowed. This entire account, nonetheless, does not provide the answer to the question inquiring what the #MeltingPot is; what is the meaning of the name and the performance. A melting pot is, in fact, a concept that is used in many social sciences and humanities. If one were to disregard all its negative connotations, especially those pertaining to cultural assimilation processes, this concept could be of great use where traditional dance approaches are concerned. The term Melting Pot refers to heterogeneous societies which through processes of mutual integration, become more homogenous, merging into a harmonious whole. It is precisely in that context that I view the Ballet School performance: the merging of traditional dance with contemporary dance, modern music and different forms of music and dance improvisations, as well as a high quality audio and visual production. The fear present in the informal discourses of many dancers and choreographers of traditional dance, that the traditional dance would be ‘damaged’ if performed in any other manner except the one recorded in researcher ethnographies, #MeltingPot has, with its performance, proven to be unnecessary. Traditional dance, although mixed with other, modern dances, has by no means lost its symbolic values, nor has its artistic form been reduced by contemporary music, modern dance, etc. On the contrary, by connecting those matters that have for long stood at opposite ends of the same plane, a different impression of traditional dance was simply obtained. What is more, it has made it accessible to the audience who would not have grasped this kind of art in its classical form. It demonstrated that traditional dance was not something anachronistic, outdated and dull, but that it is a dance equivalent to all other artistic and dance forms in relation to which traditional dance has long been established as inferior. Therefore, it is about a two-way impact between different kinds of dance – they are performed together, they influence one another, but neither dance genre attains symbolic dominance! Furthermore, the performance given has reaffirmed the thesis that dance is a synesthesic concept – we do not experience dance only by watching it or performing it, but we equally create an impression of the dance through our sense of hearing, with which it produces within us intellectual and emotional effects. In other words, we do not experience dance by mere observation, but by fully comprehending it! It is precisely in the #MeltingPot performance that we had such a complete, synesthesic impression. In addition to the combination of different types of dance accompanied by the most diverse music, our impression was also influenced by costumes, the set, the audio and visual projections, etc. Due precisely to all those factors, the Novi Sad Ballet School performance is a synesthesic performance which communicates with the audience in different ways, rousing in them different questions, ideas and criticism. With reference to that, the #MeltingPot performance is a synesthesic thaw. It is where the diverse dance genres have melted into a unique performance, whereby each genre has maintained its specific traits; while, at the same time, the conventional perceptions of how traditional dance should be shown on stage have thawed. That melted, blended mixture, named #MeltingPot, has influenced the audience through the different senses, and has thus induced intellectual and emotional urges to understand the entire performance. The audience had understood #MeltingPot in different ways, under the influence of their own experience – there were both positive and negative comments, although no one remained indifferent. And that driving mechanism that is generated is also present, when the synesthesic feature of the dance, which it possesses in itself, is utilized in the right way and in its full capacity. Unlike classical folk dance ensemble concerts that produce largely uniform emotions – except with parents who are always especially delighted with the new things their child has learned, performances of this kind lead to thinking and interpretation, be it positive or negative, but by no means uniform and indifferent. I would like to congratulate, first and foremost, the authors of the performance, Mirjana Raić and Marko Dubovac, then the children who had performed the show as if it were a routine dance, and not a debut performance. Moreover, I would like to congratulate and extend my heartfelt thanks to the Ensemble and the Ensemble director, Mr Vladimir Dekić who had the courage to give legitimacy to such a performance – few would dare to do so!